I have realized that I should just stop making biryani altogether. Other than the few times I have succeeded, its all been a bad experience. I mean we still eat it with gusto even if it turns out a little less like biryani and more like a sadam, but I cant entirely depend on it to fetch brilliant results. Its simply because I still haven't mastered the art of cooking rice to perfect consistency, chicken to perfect gravy amounts and then doing the dum. Most of the time I have a very impatient husband whining in my ear about 'the damn dum' method saying its been kept for too long, and its ready to eat now, and we don't even need to really do the dum method. By that time even I'm impatiently waiting to dig into the biryani and fall for everything Ro has to say. So to sum it up, my biryani expeditions are rather funny and so I've resigned to making pilaf which is much much much easier, more or less the same flavours (although connoisseurs in the field would beg to differ) and most of the time quenches my biryani craving. Remember me telling you about an unassuming cookbook a friend had gifted. Well that book is called 200 curries by Sunil Vijaykar and it has sooo many amazing and super easy recipes, perfect for a lazy bum like me. This pilaf recipe has been adapted from the book and can be whipped up in no time. The ingredients list may look massive, but really, it can be whipped up in a jiffy. Its also kind of like a one pot meal, perfect for those winter nights indoors. Clean and slice the chicken thighs into small bite size pieces and marinate with yoghurt, coriander powder, chilli powder and curry powder for about 1/2 an hour or if you have time, longer in the refrigerator. Warm the milk a bit and soak the saffron threads in them. You can go about getting all your other ingredients ready while the meat is marinating. When you are ready to cook, place a deep, heavy chefs pan on medium high heat and pour in 1 tbsp of oil. Once cooked, drain and keep aside. Into the same pan (add more oil if required) throw in the spices- cumin seeds, cardamom, cloves, cinnamon and bay leaf- and wait for it to sizzle and release all the aroma. Throw in the onions and garlic and sauté till the onions wilt and turn a golden brown. In goes the frozen peas and the precooked chicken. Sauté well on medium heat, just to thaw the peas. 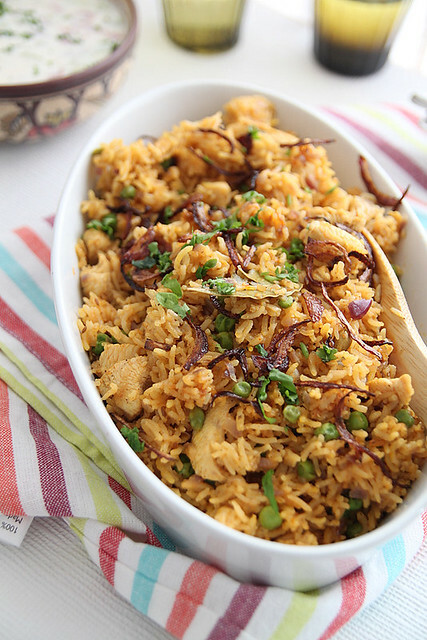 Add the drained rice and stir it in gently, so that all of the ingredients are well combined. Into the chicken stock, add the saffron milk and give a gentle stir. Colour would change, but that's fine really. Also do a taste test to check for salt as you don't want to over do it while adding salt to the rice. When the rice becomes a wee bit glazy add the chicken stock, season with salt and give a final stir. Close with a tight fitting lid and simmer for 15 minutes or till the rice is perfectly cooked. While the rice is cooking, heat some oil in a sauce pan and fry the shallots till crispy and brown. Drain on paper towels and keep ready. When the rice is cooked, take it off the flame and leave it covered for a further five minutes. Then fluff the rice using a fork and transfer to a serving bowl. Garnish with the fried onions and coriander leaves and serve with some cucumber raita. Notes: The original recipe called for dried apricots/ sultanas (125gms) but I don't like to bite into those and so didn't bother adding them. If using, stir it in with the chicken stock. I dissolve a chicken cube/ bouillon in 2 cups of boiling water just before adding to the rice, which starts boiling on the hob top almost immediately. I then close with a tight fitting lid and cook on low heat for about 10 to 15 minutes, checking half way through with a fork, if the rice is cooked or not. If you don't want to marinate the chicken before hand, then throw in all the masala powders after you cook the onions and garlic and then add the chicken and cook completely. Continue from the step where you add frozen peas. You can replace the oil with ghee if you prefer it that way. Also, adding the spices (cardamom, cloves and cinnamon) are completely optional. Add paneer instead of chicken and also slice a bell pepper and add along with the onions if you want a veg version. Replace curry powder with any meat masala. LOL Nisha...When ever i listen to my hubby i too end up in a mess.....I think cooking biriyani needs a bit of patience and practice, not so tuff as u think..once u get the hang of it,it is easy..I follow one way to cook my rice which turns out well for me everytime i cook...you can see that method in my biriyani recipes if u wish to cook biriyani again...and I am a great biriyani fan....everytime i hear biriyani it just makes me want some...an du just did. I can see a biriyani cooking in my kitchen this week!! I have couple of those hamlyn books...had 2 recipe disasters and they are left in shelf....they are quite simple, but i wuld never follow the recipe without tweaking it. Nom nom nom! 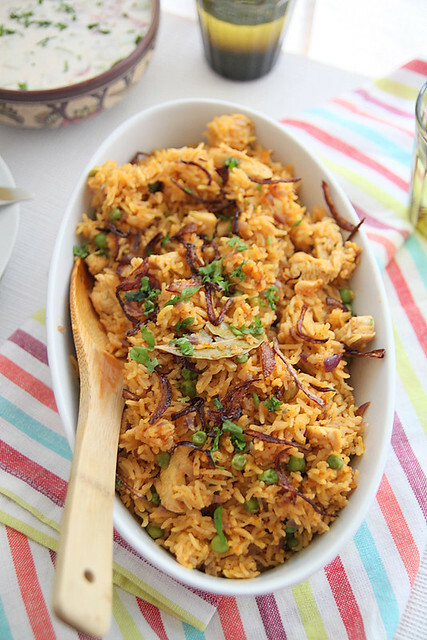 I make (a version) of this spicy chicken pulao on a pretty regular basis--like you said, it satisfies the craving for biryani (seriously, who has that kind of time anymore?). Very delicious and colorful biriyani. Excellent preparation. Entammoooooo ithu adipoli...Ingane okke undakkiyal pinne engane control kittum..Soooooo good dear. Beautiful clicks too..
oh my! I have bookmarked the recipe, and will have to try this soon! It looks so good! 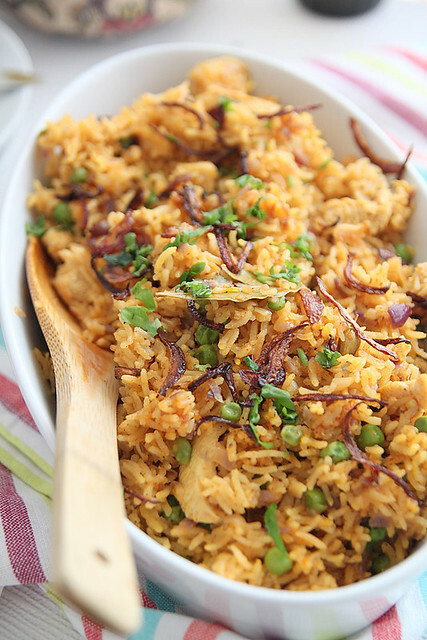 Who will say no to this super flavourful chicken pilaf,truly inviting. This looks so inviting..nice recipe dear..will surely try this. 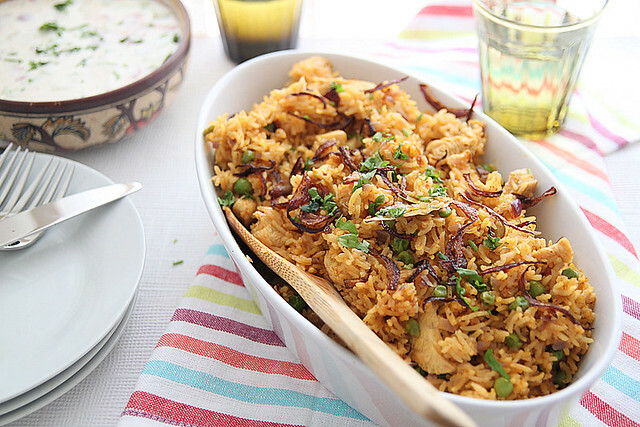 Never tried pilaf, it looks more like a biriyani only,for a change maybe I should try this too. looks sensational. and your photos are beautiful. very nice job! Wouldn't this just be perfect on a cold winter night? So aromatic and so flavorful. Thanks for making my stomach growl :-) I hope you had a lovely Monday. I'm ready to get baking! I have a banana bread recipe that I'm excited to try tonight. Much love from Austin! 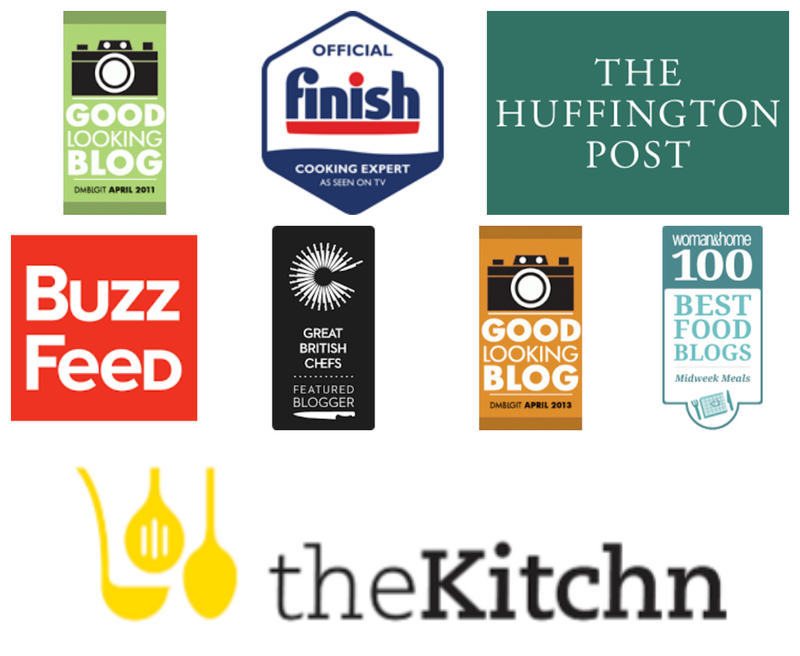 Hi there- first time on your blog, love the recipe and the blog . Lol..you are hilarious! I was laughing my guts out aftering reading your opening stanza... :) Yep, pilaf is so much easier to whip up, I usually do it in the pressure cooker--it just takes 3 min once it's reached full pressure. I'm planning on doing pilaf again this week and taking some pics for the blog. But I'm in the mood to dig into yours now. Ha. Not sure, how I missed reading your blog so long! You have amazing pictures! And love reading your posts and recipes. Your pics make it mouth watering!! Made this today when my friend visited me for lunch - i was done n cleaned up in under 2 hours :) and it was yummy as well. Made this again for Easter Nisha.. SO happy :) even better than last time .. Im sending this recipe to couple of my friends who are as lazy as me ,lol, but need impressive results ..